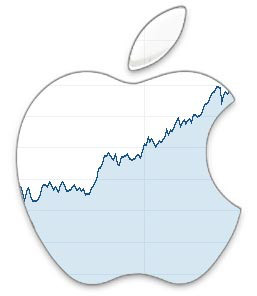 Apple on Tuesday reported revenue of $42.4 billion for the June quarter, the company’s 3rd fiscal quarter. That included earnings of $7.8 billion, or $1.42 earning per share (EPS). Those results were down from the year ago quarter of $49.6 billion in revenue and $10.7 billion in earnings. It was within Apple’s own guidance of $41 to $43 billion, and earnings beat analyst expectation. Apple also reported gross margins of 38%, at the high end of its guidance range of 37% to 38%. While down year-over-year, investors cheered because Apple beat analyst expectations of revenues at 42.1 billion and EPS of $1.38. Shares traded higher in the after-hours sessions at $101.79, a jump of $5.12 (+5.30%). Shares closed lower during the regular session at $96.67. That’s down $0.67 (-0.69%), on heavy volume of 42.3 million shares trading hands. The company sold some 40.4 million iPhones. That’s down significantly from the year-ago quarter when Apple sold 47.5 million iPhones. iPad sales came in at 9.9 million units, while Macs clocked in at 4.2 million units. Apple CEO Tim Cook told The Wall Street Journal iPhone sales were better than they looked because Apple decreased channel inventory during the quarter. Apple is offering guidance for the September quarter of revenues between $45.5 and $47.5 billion, with gross margins between 37.5 and 38 percent. Up by a factor of over 12 in 10 years. I suspect that in 10 more years, it’ll average a similar $11 per year increase. There’ll be plenty of ups and downs, but I’m not selling. My comment about AAPL surging to over $100 was directed at cb, who I rarely read much anymore, but I couldn’t help but notice his prediction: “just don’t expect APPL to ever surge over $100 ever again” – so similar to when Brad recommended that AAPL shareholders sell at $200 a share and then watched as AAPL prices rose to $800 a share (pre 7:1 split value). Was hilarious then, and is hilarious now. So, as AAPL continues to rise, I will point to this cb failed prediction as, like I said, par for the course. And a very nice AAPL surge above $100. Huh. Go figure. Failed predictions yet again. Par for the course. During the Q&A not one analyst asked if lack of new Mac hardware( for some Mac models – we all know which ones ) is contributing to the Mac sales decline. In fact, the Mac wasn’t mentioned AT ALL by the analysts. The Mac business is still huge but didn’t merit a question. Maybe everyone was coached not to ask any embarrassing questions. Interesting statistic: Apple expects its services sector, which continues to exhibit growth despite slumping iPhone sales, to generate revenues equivalent to that of a Fortune 100 company next year. Excellent!! Frankly, I love Apple Music, and have no problem paying the $16 a month for my family to listen to whatever they want. Apple will continue to grow this category to huge revenue over time. Bryan, Apple shows incredible performance once again, in light of huge share repurchases and dividend payouts. Services are experiencing big-time growth, and for App Store revenue to hit an all-time high like it did when in the world of android most is given away demonstrates how strong Apple products are. Full steam ahead for AAPL! !